Where's will you take you? Floriade 2010 features more than one million blooms as a backdrop for fantastic entertainment, displays and a whole program celebrating the theme of imagination and runs from Saturday 11 September - Sunday 10 October, 2010. See the dazzling Katie Noonan and The Captains headline on Saturday 18 September, catch 2010 CMAA Female Artist of the Year, Felicity Urquhart on Sunday 10 October along with fresh local talent in the Telstra Road to Tamworth heats, hear weekday lunchtime concerts by ANU School of Music, be enthralled by street performers, comedy acts, community performances and dance. Ride the giant 35 metre ferris wheel for a spectacular overview of Floriade exploding into a cornucopia of colour in concert with spring. Be captivated by exhibitions and displays to inspire imagination and innovation, see incredible inventions from 500 years ago brought to life at the Da Vinci Machines Exhibition. Imagine being pampered with complimentary mini massages, facials and hair styling in Garnier World between 22-26 September. Taste the latest range of Lindeman’s Early Harvest and Sweet Seasons range and enter their fabulous Hanging Basket Competition plus get advice from Meredith Kirton and chef Dominique Rizzo. The DonateLife concert and celebrity sports events will wrap up the opening ceremony of the 12th Australian Transplant Games at Floriade on Sunday 3 October. See theatre costumes and fashion from ‘Concept to Catwalk’ matched with flowers and learn from demonstrations by leading floral artists in the Interflora Exhibition Marquee. Discover ideas to take home to your garden when you explore the Showcase Garden Competition, learn techniques, tips and tricks with a feast of presentations coming to the Kitchen Garden and ActewAGL Look ‘n’ Learn Marquee. Families will love the Patting Paddock, great kids’ programs, gnome painting and amazing creatures at the Riveting Reptile exhibition. For five nights only, from Wednesday 22 to Sunday 26 September Commonwealth Park transforms into an illuminated wonderland of beautiful blooms and non-stop entertainment. Stunning new lighting will make this year’s NightFest truly magical. Be enchanted with movies, comedy, acrobatics, relax in the Butterfly Lounge with DJs and cocktails, bustling night markets, food, wine and plenty to entertain you the whole night long. Make a date with Floriade 2010. There are plenty of things to see and do in the capital this spring. Stay tuned for the full program and details here soon. So come on, see for yourself! Call 1300 554 114 or go to visitcanberra.com.au for visitor information and great Floriade Canberra accommodation deals. For regular updates, and insider information follow the Official Floriade page on Facebook and out Twitter feed at Floriadeaust. Floriade is Australia’s celebration of spring and the biggest flower festival in Australia, set in Canberra's Commonwealth Park, in the heart of the nation’s capital. From Saturday 11 September to Sunday 10 October enjoy uplifting entertainment; sample regional food and wine; learn from informative workshops and educational demonstrations; shop in the bustling Floriade markets and meander among themed garden bed displays. Click here to download a print version of the Floriade map in PDF format. As you tiptoe through the tulips, imagine the conditions of nature that must act in concert to make the blossoms of Floriade a success. The weather in Canberra is wonderfully seasonal and is often unpredictable, so bulb varieties, plant species, soil types and planting methods are continuously tested with the aim of ensuring that all of the million-plus flowers bloom beautifully on cue. Enjoy new types of blooms every year as Floriade showcases exciting new bulb varieties. Exotic sounding varieties such as Tulipa Black Diamond, Violetta Tiny Tots Blueberry Banana and Tulipa Top Parrot bloom together to create sweeping designs of colour throughout the park. Over 1 million bulbs and annuals are planted each year, depending on the garden bed design. Bulbs and annuals are planted in autumn each year. Different flowers bloom at different times but there’s always great colour throughout the event. It is constantly changing as the different plants come into flower, so visit a few times if you can. How are the garden beds designed? The garden bed design at Floriade is different every year. A theme is developed and is carried through from the shape of the garden beds to the type and colour of the flowers used to create the meticulous designs. The garden beds are designed by a local consortium LANDSCAPEalign, comprising of three Canberra companies who come together each year with their specialist skills to create the unique designs. The design process commences 18 months before the event begins. Click on an image to open a full-screen display. You can then enjoy the Floriade experience with the navigation on the lower right. Floriade began in 1988 as a spectacular commemoration of Australia's Bicentenary and Canberra's 75th birthday. Floriade blossomed for the first time with a stunning floral display of exotic bulbs and annuals, which grow beautifully in Canberra's climate. The community embraced the inaugural Floriade, making it such a success that it became an annual event - Australia's celebration of spring. Since its beginnings in 1988 Floriade has been held in the city, in Canberra's Commonwealth Park. Floriade is Australia's premier spring festival and a world-class floral spectacular. More than one million blooms create a stunning backdrop to a month-long festival filled with music, cultural celebrations, horticultural workshops, artistic displays, entertainment and recreational activities. Floriade runs from mid-September to mid-October and attracts more than 400,000 attendees. Click on an image to open a full-screen display. You can then rediscover past themes of Floriade since 1988 with the navigation on the lower right. As Floriade grows, so do the challenges economically, socially and environmentally. 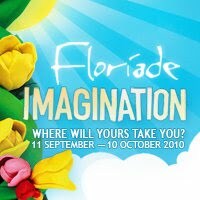 In meeting these challenges Australian Capital Tourism has developed a Strategic plan for Floriade for the period 2009–13. This plan provides a blueprint to focus our activities in developing and growing Floriade as a world-class tourism event. The plan acknowledges our role as industry leaders in developing tourism in the ACT as well as innovation in environmental practices. For your convenience, bicycle racks provided by Pedal Power are located at the Parkes Way and Regatta Point entrances to Floriade. Make sure you bring your own chain and lock, as bicycles and tricycles must be left at the gate. A partnership has been established with the Department of The Environment, Climate Change, Energy and Water who are sponsoring the green component of the Floriade and NightFest. Energy saving globes have been installed for public space lighting and LED power saving globes have been procured for the aesthetic lighting for NightFest. Floriade’s official caterers are assisting with our green mission by using recyclable serving containers such as bamboo plates and utensils as well as recycled paper goods such as napkins. We have also provided our workforce, volunteers and long term suppliers with reusable drink bottles and have ordered bulk Neverfail dispensers to reduce the amount of plastic bottles. Additional recycling facilities will be installed throughout the park to encourage patrons to recycle their waste paper, glass & cans. As well as mass recycling facilities for use for caterers and suppliers. Floriade’s main water supply is provided from Lake Burley Griffin. In partnership with the National Capital Authority, Australian Capital Tourism is committed to ensuring responsible water usage and management for Floriade. The sprinkler system in Commonwealth Park has been changed from the quick coupler system to an automatic irrigation system which allows for better efficiency and accuracy. Accountability measures from the horticultural maintenance team to be more vigilant on water usage. The Floriade Horticultural Service Provider, Parks Conservation and Lands has calculated water use for both best case and worst case scenarios for Floriade. The best case scenario is 2.24 Mega litres (2.24 million litres) per annum and worst case scenario is 3.4 Mega Litres (3.4 million litres) per annum. For Floriade 2007 the Horticultural Service Provider achieved best the case scenario due to rainfall levels experienced during the restoration period (post Floriade where the park is restored to its natural state). Wetting agent – to aid in moisture absorption. It will help the mix absorb moisture quicker and more evenly through out the mix, saving water. Gypsum – to improve soil structure, increase water penetration and increase aeration which will enhance plant root development. Trace elements – providing plants their full nutritional requirements. Controlled release fertiliser – contains controlled release of nutrients for up to nine months of healthy plant growth. Australian made – Martins Fertilizers is 100% family owned Australian company. Floriade pots and hanging baskets contain the same Floriade Garden Soil, including its water saving capabilities. The Floriade Horticultural Service Provider cap off sprinkler in areas of Commonwealth Park where water is not required, i.e. under marquee sites and adjacent to event catering areas. Floriade Showcase Gardens presented by Actew Corporation – exhibitors are required to use low water use and drought tolerant plants where practical. Exhibitors are also asked to consider other elements of water conservation for example, the use of mulches and water reservoirs for water features. After Floriade, Commonwealth Park must be restored and rectified by the Floriade Horticultural Service Provider in accordance with guidelines determined by agreement with the National Capital Authority. This includes returfing areas of Commonwealth Park that have been affected by Floriade garden beds and infrastructure. Turf varieties that require less water to establish and maintain are used wherever possible, for example Couch grass. This particular variety could survive if stage 4 water restrictions come into effect. Follow the magic beanstalk to a world of entertainment and discovery set among a million blooms. There will be concerts, exhibitions, displays, presentations, demonstrations, activities and a whole program celebrating the 2010 theme. There’s plenty to see and do, so come and let your imagination run wild and see where yours will take you. Look out for the artist’s pallet, beating drums, dancing ballerinas, flying carpet and Aladdin’s Magic Lamp. Lose yourself in Lollypop Land and the Butterfly Playground or escape to an alien landscape as you weave your way through the dazzling garden bed displays. Don’t miss the edgy vocals of Katie Noonan and her new band the Captains (September 18) and 2010 CMAA Female Artist of the Year, Felicity Urquhart’s guest performance at the Canberra heat of the Telstra Road to Tamworth (October 10) and so much more. Be transported to by-gone eras with elaborate theatre costumes matched with floral pieces in a fairytale wonderland at the Once Upon a Time Exhibition. Watch renowned floral designers create beautiful arrangements, nurture your green thumb, learn to create your own kitchen garden or simply admire the endless possibilities of the imagination with exciting demonstrations, activities and displays. Imagine a brighter future for those awaiting organ and tissue transplants at the launch of the 12th Australian Transplant Games on October 3. Participants and supporters will parade through the blooms and enjoy a special DonateLife concert to raise awareness for this important cause. Compete against transplant recipients on the lawns of Stage 88. See the incredible inventions of Leonardo da Vinci as they are brought to life at the Da Vinci Machines Exhibition during Floriade and Floriade NightFest. This ticketed exhibition features more than 60 interactive machines based on da Vinci’s original drawings. * The Da Vinci Machines Exhibition is a separate ticketed event within Floriade and Floriade NightFest. Relax at the Lindeman’s Open Garden. Sample and purchase Lindeman’s Early Harvest or Sweet Seasons ranges, enter the Lindeman’s Hanging Basket Competition and gain expert advice from the Lindeman’s ambassadors, renowned gardener and horticulturalist Meredith Kirton and celebrity chef Dominique Rizzo. Be pampered with a complimentary treatment including a mini massage, facial or hairstyling in a living, breathing beauty paradise. Meet Joel Hurrey, resident horticulturalist on Channel Nine’s top rating Domestic Blitz. Open day and night from 22 to 26 September. Kids are sure to have a blast with plenty of fun activities, from music, gnome painting and DIY workshops, to patting farm animals and reptiles and riding the giant ferris wheel. Spring is the perfect time to invite your family and friends to Canberra as there is plenty to see and do in the nation’s capital. But don’t take our word for it, come and see for yourself. Floriade’s after dark extravaganza returns with a spectacular new line-up of entertainment and activities, including side-splitting comedy, live music, night markets and films under the stars. Stunning new lighting will make this year’s Floriade NightFest more magical than ever. Go to www.ticketek.com or call 13 28 49 to buy your tickets now! Commonwealth Park is transformed into an illuminated wonderland of beautiful blooms and non-stop entertainment. Floriade NightFest will enchant you with everything from movies, comedy, acrobatics, cocktails, bustling markets, food, wine and plenty more to keep you entertained the whole night long. and head for the giant inflated screen where you can watch films under the stars. Visit the Carnival Stage & Bar where performers such as Patrick McCullagh, Dave Thornton, Mr Quirk, Jacques the Cheeky French Waiter and the List Operators will have you in stitches. This year Floriade NightFest adds a whole new ingredient to the mix with Garnier World, a living, breathing beauty paradise where you can be pampered with complimentary treatments including mini massages, facials or hair styling. Continue to spoil yourself by dropping into the Butterfly Lounge for delectable cocktails and groovy tunes by a great line-up of DJs and musicians. Watch renowned floral designers, Michael Woods from the House of Holland Florist and Bernie Gadd from Champagne and Roses Florist, create beautiful arrangements in the ActewAGL Look 'n' Learn Marquee. There’s plenty for the kids as well, including the National Zoo & Aquarium’s Riveting Reptiles Exhibition and side-splitting comedy and amazing acrobatics by The Gigalees Crazy Circus Show at the Floriade Kid’s Corner. Buy your Floriade NightFest tickets now! *Price per night. Transaction fees apply. Some activities around the park will incur an additional fee. Floriade is a month-long festival, open seven days a week. Saturday September 11 - Sunday 10 October, 2010 at Commonwealth Park. Last entry to the event is 30 minutes before closing. For more detailed information about visiting Floriade, please read the frequently asked questions. Floriade is held in Commonwealth Park, a five-minute walk from Canberra’s city centre. There is limited parking available at Acton Park. Other parking choices, including the Canberra Centre car parks, are highlighted on the map. Depending on the location and day of the week, fees generally apply. Free parking for people with limited mobility is available adjacent to the Regatta Point entry (access off Commonwealth Avenue). Parking is limited and vehicles must display an authorised disability permit. A 'special event' bus stop will be installed on both sides of Commonwealth Ave, adjacent to the main entry to Floriade. ACTION buses provide regular bus services between Floriade and the city's four main town centres. The best bus routes on weekdays are 300, 312, 313, 314, 315, 318 and 319. The best bus route on weekends is 900. From Belconnen Bus Stations: Platform 3 for Cohen St Station; Platform 1 for Lathlain and Cameron Bus Station. The nearest bus stops to Floriade are located on either side of Commonwealth Ave near Albert St and either side of Commonwealth Ave near Albert Hall. ACTION buses provide regular bus services between Floriade and the City. The best tourist bus route that travels via many of Canberra's attractions within the Parliamentary Triangle as well as Commonwealth Ave, on weekdays is Route 3 from Platform 2 at the City Bus Interchange and on weekends is Route 934 from Platform 7 at the City Bus Interchange. For timetable information ring ACTION’s Customer Service Centre on 13 17 10 or visit action.act.gov.au to obtain ticket and timetable information. Just a pleasant walk from the City and you are at Floriade. The Canberra Centre to Floriade via Allara St and across Parkes Way overpass will get you to the Parkes Way Entry in approximately 10-15 minutes. Walking from the Commonwealth Ave bus stop near Albert St will get you to the Regatta Point Entry in approximately 5 minutes. Why not ride your bicycle to Floriade and enjoy the fresh air? For your convenience, bicycle racks provided by Pedal Power are located at the Parkes Way and Regatta Point Entry to Floriade. Make sure you bring your own chain and lock, as bicycles and tricycles (including hand-propelled tricycles for young children must be left at the gate). You’ll find the ferry stops adjacent the Ferry Gate entrance at Floriade. Check with the operator for their departure location point and costs. Floriade is located on a four hectare site. The circuit around Floriade is approx 1.6km and contains some loose granite pathways. Please wear sensible footwear and take all necessary precautions to prevent injury to yourself or those in your party. For visitors with limited mobility there is free parking available adjacent to the Regatta Point Entry (access off Commonwealth Ave). Parking is limited to vehicles displaying an authorised disability parking permit. Registered guide dogs and companion dogs are allowed into the Floriade grounds with their owners. Documentation for these animals is required upon entry. Floriade has minimal stairs. Display marquees and markets in the Floriade Village are all at ground level. Most marquees are fixed with accessible ramps. Accessible toilet facilities are also available across the event site. Paths are wide enough to accommodate pedestrians, wheelchairs, electric scooters and strollers. Be aware there are some loose gravel pathways and there may be water on pathways after rain. A limited number of wheelchairs, electric scooters and strollers are available for hire from the Wheelchair Marquee located inside the Regatta Point entrance. Bookings can be made by phoning the Wheelchair Marquee on 0450 962 245. We will need your name, contact phone number, the number of wheelchairs, electric scooters and/or strollers required and the date and preferred time for the booking. It is possible to hire and book on the day at the Wheelchair Hire Marquee, however priority is given to previous bookings. In the interest of public safety, all forms of bicycles and tricycles, including hand-propelled tricycles, are not permitted within the grounds of Floriade. Bicycle racks are provided at the Parkes Way and Regatta Point entrances. You must provide your own lock and chain. Provision can be made for tricycles to be stored at any of the entry gates, however Floriade takes no responsibility for theft or damage. For your convenience, strollers can be hired for $5 per day from the Wheelchair Hire Marquee located at the Regatta Point entrance. Workshops will be run by Geoff Comfort and Ben Kopilow, both members of the Australian Institute of Professional Photography and experienced photographic lecturers. Geoff and Ben will both attend each session. The sessions are stand alone and not part of a series. Short course notes will be supplied to participants. The sessions will include two hours of hands-on workshop and a 30-minute debrief and photo critique. To get the most value from the workshops it is recommended that participants bring a camera that has a manual override. Numbers will be limited to a maximum of 12 participants. Book early to avoid disappointment. Workshops will also require a minimum number of 8 participants to run..
$154 per person (GST inclusive). Workshops are limited. Bookings are essential. Unlock your imagination as the daytime festivities of Floriade spill into five spectacular nights of fun and enchantment at Floriade NightFest 2010. Floriade’s after-dark extravaganza returns with a spectacular new program, including comedy, acrobatics, music, shopping, cocktails and movies under the stars. From 22 to 26 September, experience an illuminated wonderland of beautiful blooms, fun activities and thrilling entertainment for all ages. Chill out at the new Butterfly Lounge, sipping delectable cocktails and grooving along to tunes from talented DJ’s and musicians. Join renowned artists and comedians such as Patrick McCullagh, Mr Quirk, Jacques the Cheeky French Waiter and Dave Thornton at the Carnival Stage & Bar. Pack a picnic, gather your friends and family and head for the outdoor cinema in the park. A diverse selection of films, including new releases and special features, will be screened nightly on a giant inflatable screen. Visit Garnier World, a living, breathing beauty paradise where you can be pampered with a complimentary treatment including mini massages, facials or a hair style. You’ll also receive a beauty gift to complement your Garnier experience. Bring the kids along and discover the world of reptiles at the National Zoo & Aquarium’s Riveting Reptiles Exhibition. They’ll giggle the night away with the side-splitting antics and amazing acrobatics of The Gigalees Crazy Circus Show. Take your NightFest experience to new heights by taking a ride on the giant 35-metre ferris wheel for breathtaking views of the illuminated park and surrounding cityscape. Spectacular new lighting effects will make this year’s event more magical than ever. Get your tickets today and be swept up in the magic of Floriade NightFest. Floriade transforms into an illuminated wonderland where visitors will be surprised by hidden delights and surrounded by breathtaking lighting that sprawls from the garden beds into the trees and skies above. From a surreal green luminescent alien landscape to a dazzling vista of stars and searchlight beams, immerse yourself in the spectacular festivities that will make this year’s Floriade NightFest more magical than ever. Pack a picnic and enjoy a night out with family and friends at the cinema in the park where you can watch a diverse selection of films under the stars. Enter a living, breathing beauty paradise where you’ll be pampered with a complimentary treatment including mini massages, facials or a hairstyle. Garnier World is open day and night from 22 to 26 September. All visitors will receive a gift to top off their Garnier experience. Laugh the night away at the Carnival Stage & Bar with an evening of stand-up comedy, acrobatics and magic by Jacques the Cheeky French Waiter, Mr Quirk, the List Operators and Dave Thornton. The night will be hosted by the highly entertaining Patrick McCullagh. Groove to a great line up of DJs and live music in the Butterfly Lounge. It is the perfect venue to enjoy a cocktail and a range of music from funk, house and chill out tunes to Reggae, live drumming, RnB and soul. Be transported to bygone eras at the Interflora Exhibition Marquee and watch renowned floral designers, Michael Woods and Bernie Gadd, create beautiful arrangements in the ActewAGL Look 'n' Learn Marquee. Visit the Floriade Kid’s Corner for side-splitting comedy and amazing acrobatics by the Gigalees Crazy Circus Show or for some clever and fun relaxation with the Animalates ‘sleepy animals’ classes. There’s plenty to keep the kids entertained with the National Zoo & Aquarium’s Riveting Reptiles and ever popular carnival rides. Relax with a cocktail under the stars at the stylish Glow Bar or wander around the bustling night markets and shop till your heart’s content. Join a special guided tour of the Da Vinci Machines Exhibition*, exclusive to Floriade NightFest. Bookings are essential and run every hour from 6.40pm. Be entertained by the amazing fire twirling performers and the stunning Fluro Dollies and Raining Men as your roam around the park. Test your skills and your mind at the Shell Questacon Science Circus exhibition featuring a collection of Questacon’s all time favourite interactive exhibits. Go and enjoy the beautiful Floriade . . . . . . don't miss it and take a camera. I came across your blog and found this blog very useful and helpful to me and we also provides the services which will be beneficial to your readers.we are Insta Group offering Best Quality Exhibition Stand Design,Best in Customized Exhibition Stand Design.we have Award Winning Designers Of Exhibition Stands Best in Exhibition.thanks Exhibition Stand Design"interesting post, we will be following your blog in future more closely"
Lawn suppliers Sydney are highly acknowledged and reckoned for their prime quality services and products.